Those words were not uttered by a pacifist, but by a legendary World War II general, a man who commanded 1.3 million men, the largest body of American soldiers ever to serve under a US field commander. They are the words of General Omar Bradley. 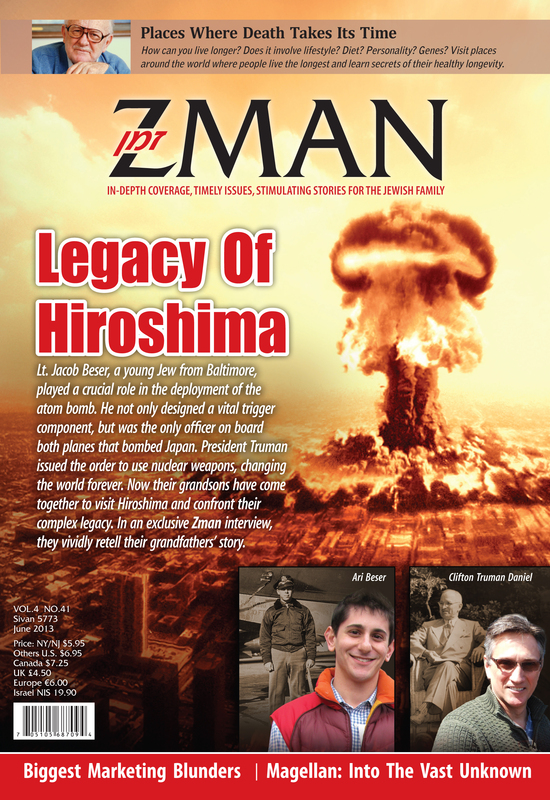 Bradley’s warning echoes through time and reverberates throughout this month’s cover story, where we interview a grandson of Harry Truman – who authorized the dropping of the atom bomb — and the grandson of a Jewish air force lieutenant who flew on both atom bomb missions. The larger purpose here is not to question Truman’s decision, which was made under unique, arguably once-in-history circumstances. Rather it is to give context to current events that haunt us today. As rogue states with unstable leaders guided by fanatical ideologies brandish their nuclear arsenal or are very close to coming into possession of them, r’l; as terrorist groups vie to get – or get more — weapons of mass destruction; as terrorist attacks strike closer to home, we feel increasingly concerned and helpless. Even if we turn back a threat from one quarter there always seems to be another madman waiting in the wings. Can we do anything about it? The last words of Tanach indicate that we can: “And he [Eliyahu] shall turn the heart of the fathers to the children, and the heart of the children to their fathers.” Rabbi Eliyahu Dessler suggests that the deeper meaning here is that there will be a gilui Eliyahu – a “revelation of Eliyahu” – that will precede the “great and fearsome day of Hashem.” Gilui Eliyahu refers to a deeper and more profound level of Torah knowledge. The proliferation of Torah will counter the proliferation of WMDs. In the post-atomic world, the urgency for every Jew to discover and fulfill his portion of Torah is more pressing than ever. This entry was posted in History, Zman Magazine and tagged atom bomb, hiroshima, jacob beser, nagasaki, nuclear bomb, truman, weapons of mass destruction.